Aviation Aerographer's mates are the Navy's meteorological and oceanographic experts. While they do a lot of what the meteorologist at your local news station does, checking weather patterns and temperatures, their jobs go a lot deeper than predicting inclement conditions. If you enlist in this rating (which is what the Navy calls its jobs), you'll learn how to predict weather and oceanography conditions. These sailors are trained in meteorology and oceanography, and learn to use instruments that monitor air pressure, temperatures, humidity, wind speed, and other weather characteristics. They provide this information and their analysis of Navy aircraft, ships, and shore activities. In addition to recording and analyzing weather and oceanographic information, they issue weather forecasts and warnings, make sure Navy weather maps and oceanographic data are up to date, and brief Navy personnel. 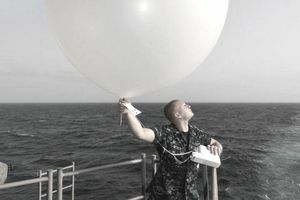 They calibrate and test meteorological instruments such as satellite receivers and balloon-carried instruments, and they operate, program and maintain computers and related meteorological equipment. Men and women in the AG rating perform their duties in office-like environments. There's not a lot of physical work involved, but these sailors work closely with others. Since they're highly trained, most of the work these sailors do need little supervision. Aerographer's Mates are assigned as weather observers following completion of their initial training. An observer tour is required prior to attending Forecaster "C - School" (advanced training). Upon completion of Forecaster "C -School," follow-on assignments as an AG will be for Forecaster Billets. Sailors in the AG community can expect to serve more than half their careers in operational support tours ashore. Following boot camp at Recruit Training Command Great Lakes in Illinois, you'll spend 86 days at Keesler Air Force Base in Biloxi, Mississippi. If you decide to enlist in this rating, you'll need to be able to qualify for a secret security clearance from the Department of Defense. This involves a detailed background check which will investigate your finances and any criminal background. Drug and alcohol abuse may be disqualifying factors. You'll need a combined score of 162 on the verbal expression (VE), mathematics knowledge (MK), and general science (GS) segments of the Armed Services Vocational Aptitude Battery (ASVAB) tests. In addition, you'll need normal color perception and must be a U.S. citizen to enlist in this rating. Sea tours and shore tours for sailors that have completed four sea tours will be 36 months at sea followed by 36 months ashore until retirement. AG is classified as an INUS/OUTUS (in the U.S./Outside the U.S.) community, which means that instead of being assigned to ships, many of these soldiers' overseas assignments are classified as sea tour duty for sea/show flow purposes.